PET film (BOPET) is used in a wide range of applications due to a combination of optical, physical, mechanical, thermal, and chemical properties, as well as its unique versatility. Mainly it is used in many types of flexible packaging applications ranging from food and drugs to industrial and consumer goods. As plain or metalized, formable, heat-shrinkable and/or coated for barrier, metal adhesion, laminating adhesion, extrusion coating adhesion, printing or sealing. PET film offers excellent characteristics for the packaging market. It is in the flexible packaging market sector that this grade of is expected to generate the greatest interest. To date, since many types of multi-layered packaging incorporate a layer of PET, the option of benefitting from using oxo-biodegradable technology was not possible but now can offer this. The grade for PET film is unique and it is generating great interest to the many brand owners who use this type of film in their packaging. 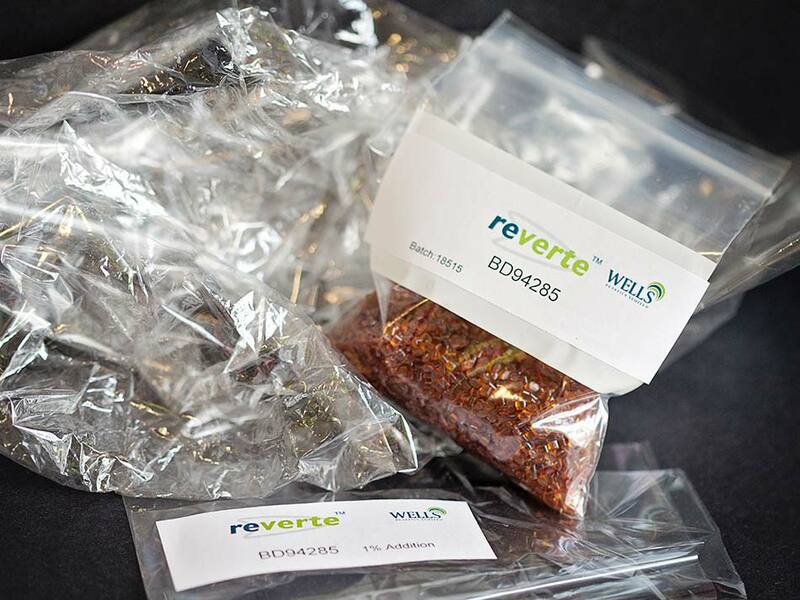 Wells Plastics has completed testing of multilayer laminates made of PET, BOPP, MET PET, MET BOPP, PE films incorporating Reverte™ in all the layers and it has now been well proven that multilayer films/packaging incorporating Reverte™ will oxo-biodegrade if these items end up in the open environment. Poly(etheylene terephthalate) has a molecular weight of 192g/mol and a molecular formula (C10H8O4)n. The molecular structure of PET contains a -CH2-CH2- group, as found in polyethylene. There are also several other sub-groups within the structure which leads to other oxidative reactions taking place to produce degradation of the molecular structure. Consequently the oxidative degradation of PET comprises several parallel reactions with the formation of many sub-species with end groups based on carbonyl (-C=O) from the breakage of the -CH2-CH2- and carboxyl (-COOH) from the cleavage of the ester bonds, and the evolution of volatile species such as CO and CO2. The oxidative reaction mechanisms have been investigated in many studies over a considerable time period. The absorption of UV radiation leads to these oxidative reactions by Norrish Type I and II processes or by an atom abstraction process. These reactions are catalysed by the addition of prodegradants analogous to the effects found in polyolefins. The addition of BD94285 to PET film would therefore cause polymer chain scission, the formation of carbonyl and carboxyl (which is known to act as a catalyst to promote further degradation) end-group species and ultimate embrittlement and consequent fragmentation of the polymer. The oxidised material has been analysed for susceptibility to aerobic biodegradation under controlled composting conditions in general accordance with BS EN ISO14855 (equivalent to ASTM5338) at APPLUS+ LGAI, Barcelona, Spain where the biodegradation of the oxo-degraded PET has been clearly shown to occur under these conditions. The ecotoxicity of the residues formed through these aerobic biodegradation conditions have been shown to have no toxic effects on animal and plant life when tested in accordance with OECD 207 & 208 respectively, even when tested at concentrations at and above the upper limits recommended in the test methods, and significantly greater than that which would be reasonably expected to be found in the littering environment. Grades have been formulated to be suitable for food contact applications. Major food contact specification bodies include the European Community (through Commission Regulation (EU) 10/2011 and its amendments and in America, the FDA (through their positive listings and “Chapter” suitability). Wells Plastics has conducted an extensive study on the oxo-biodegradation properties of PET FILM containing 1wt% BD94285 and has clearly demonstrated the efficacy of this additive masterbatch to catalyse the oxidative degradation of PET FILM following a period of chemical and structural stability, the dwell time, during which the PET FILM maintains its properties to at least the same degree as that of a control PET film not containing the additive masterbatch, into molecular species which are readily available for biodegradation through the action of microbial activity in a simulated composting environment. Furthermore, it has been demonstrated that the residues formed through the oxidative degradation and biodegradation processes, have no toxic effects when tested on animal and plant life.